Beauty and the Beast is absolutely one of the best animated films of all time. When it first came out. it was a modern marvel and is now a pure classic. One of the best tellings of the story. This bluray was released a few months ago and now Disney has released it again with the 3D bluray disc along with all the other discs. The 3D actually elevates the original content through the new 3D effects. The same AMAZING audio mix and all the same great extras made it to this release. A must own for any fan of the film and for 3D tv owners. There has been many versions of this tale throughout the years, but I find myself always thinking of this Disney animated version each time someone mentions Beauty and the Beast. It’s that good. It’s full of adventure, excitement, romance, and magic. Not to mention it was a landmark in 2d animation with that big musical number where Belle and the beast dance in the big ballroom. We all know the story of Beauty and the Beast and Disney makes this is a modern day classic all over again when they released this. The supporting characters are all amazing, funny, and charming. Angela Lansbury’s voice as the teapot is just epic. I just wish she was my grandmother. Still do. And Gaston, the evil villain of the story is just done so perfectly. I really believe this version of Beauty and the Beast paved the way for newer and better ways to animate film. This set the bar very high with the new techniques they used to film this. And remember back when this film came out all those years ago, t was nominated for best picture at the Oscars. In today’s world, it is fairly common for an animated film to make it in to the best picture category, but back then, it was unheard of. And once again Disney has converted this to 3D and it is spectacular. I love this film and everything about it. For this 3D release, ‘Beauty and the Beast’ is presented in a 1080p MVC transfer in the 1.78:1 aspect ratio. With it’s conversion to 3D, you will see this film in a new and exciting way. The colors boast a super rich boldness and come across as very bright and rich in texture. The detail of the backgrounds and characters are exceptional. Everything looks simply amazing. The 3D aspect gives everything great depth. The buldings, the characters, the signs, the animals flying and hoping around all look sensational. The ballroom scene is exquisite and one of my favorite things in the film. And there is also a scene where Belle blows some petal of flowers into the wind, and I literally thought they entered my living room. Very cool. The rain sequences in the film looks awesome in 3D as well. I was very impressed as I’m sure you will be. The video is nearly flawless and just impressed the hell out of me. The audio is in a 7.1 mix and just sounds outstanding. This audio mix is demo worthy. The dialogue is crystal clear and just radiates the room. You actually feel like they are in the room talking. The music and songs are amazing and just use the full potential of the speakers. One of the better audio/visual presentations of the year no doubt. Original Theatrical Release (HD, 85 min.) – This is how the film originally appeared in theaters. Special Extended Edition (HD, 92 min.) – The biggest addition is the musical number ‘Human Again’ and has been inserted in the film seamlessly. Original Storyboard Version (HD, 85 min.) – Producer Don Hahn accompanies a picture-in-picture track that runs alongside the theatrical version. He discusses the differences and how they got from storyboard to screen. Audio Commentary – The audio commentary is available on the Special Extended Edition of the movie. The commentators include Hahn, and co-directors Kirk Wise and Gary Trousdale. The three men discuss everything about making the film. It is a lot of fun and very informative. Never does it feel boring or dull. I got a big kick out of this commentary. Sing-Along Mode (HD) – Sing along subtitles with musical numbers only. The Story Behind The Story (SD, 25 min.) – Several original fairy tales and what was done to them in order to turn them into Disney animated features. ‘Beauty and the Beast’ Music Video (SD, 3 min.) – Music video where Celine Dion sings. Blech. Early Presentation Reel (SD, 35 min.) – Hahn and Menken discuss an alternate version of “Be Our Guest,” as well as the ‘Human Again’ music number. Sneak Peeks (HD, 15 min.) – Trailers for the Blu-ray releases several Disney films. Beyond Beauty (HD, 157 min.) – Holy jumping frogs. A nearly three hour documentary on everything and anything to do with the making of this film. It’s really cool to see, but wow, very long. Composing a Classic (HD, 20 min.) – Hahn, composer Alan Menken, and Disney historian Richard Kraft talk about the original music created for the movie and also how to create a great story line. Deleted Scenes (HD, 28 min.) – Disney chairperson Peter Schneider gives two introductions to the two deleted scenes contained here. The two deleted scenes include an alternate opening to the movie, that would have changed the movie completely. It’s about twenty-minutes long and presented through storyboards. 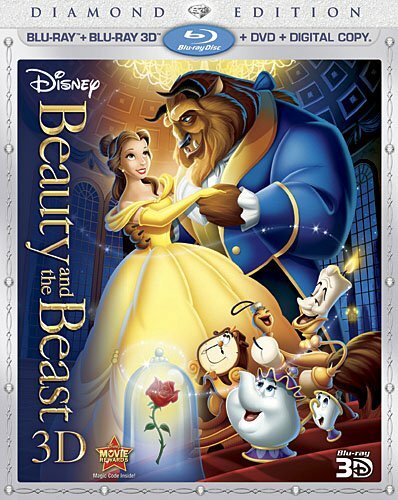 The other deleted scene features Belle exploring the Beast’s library and meeting four other characters. These were left on the cutting room floor for a good reason. Broadway Beginnings (HD, 13 min.) – An extended advertisement for the Broadway adaption of the movie. Enchanted Musical Challenge (HD) – An interactive game that consists of searching the castle and answering trivia about the movie. Bonjour, Who Is This? (HD) – An interactive game that can have multiple players and uses mobile phones to play. New ‘Beauty and the Beast’ Music Video (HD, 3 min.) – Yet another music video of Jordan Sparks performing. This 3D release is uncanny. Everything about the film is amazing. The audio and visual presentation is out of this world and the conversion to 3D is beautiful. Tons of extras pack this release to elevate your pleasure in enjoying this fine classic fairy tale. I love everything about this film and it is a MUST OWN. Definitely get this. This entry was posted on Wednesday, October 12th, 2011 at 10:25 pm	and is filed under Film. You can follow any responses to this entry through the RSS 2.0 feed. You can skip to the end and leave a response. Pinging is currently not allowed. Well, we were the faster, but now we're the tortoise to his hare. No, we're alive. If M has any idea to the contrary, that gives us an edge. The sea is vast, he could be anywhere. Yeah, well, I'm an optimist, now maybe that's a crime to you twisted so-and-so's but it keeps me from going crazy. Your optimism's out of place. You're wrong! Because we'll get out, man... at least, I will. That other agent I told you about... was my childhood friend. We were agents together until the Fantom shot him dead. Now you can be done, but I am not. I will avenge his death. It's not about any one of us, Tom, it's bigger than that. Yes, it is, Jekyll! The fate for the world is in our hands... the world! So M tricked you, he brought you all together and you walked straight into his trap. But the way that I see it, that's the part he did wrong... He brought you together. And the boy becomes a man... perhaps a leader of men.